of sharing my touch with this world, spreading more smiles, sunshine and the amazing gift of Massage. I have arrived in Costa Rica, where I will be teaching Massage to aspiring therapists during the month of May. I have had many offers to fit people in my suitcase, unfortunately delta’s baggage allowances are quite restricting…and I couldn’t fit you all in. Instead I’ve decided to share with you my precious moments in the way of a special photo each day. Todays photo was not of my destination but of my home that I’ve departed from….specifically my garden. 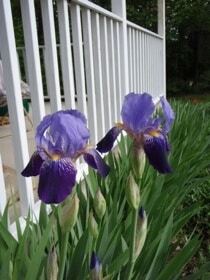 My Iris’s typically bloom for the month of May and I have dozens upon dozens of them…so it should be spectacular. Most are no where near blooming….except two that decided to greet me prior to my departure. This warms my heart, a simple miracle…. my miracle. I know other peoples Iris’s may already be blooming however mine do not typically bloom till well into the first week of May, so this was a delight!